Douglas, as he was usually known, was born at Tidworth in Hampshire in 1892. It is believed that his family came to Eton Wick in the late 1890's when his father Edwin went into partnership with his brother-in-law, Mr Nottage, as farmers at Dairy Farm, Common Road. It appears that the Ashman family lived at Dairy Farm, and the Nottage’s along Tilston Lane, now all part of Eton Wick Road. Douglas was remembered as a reserved lad. 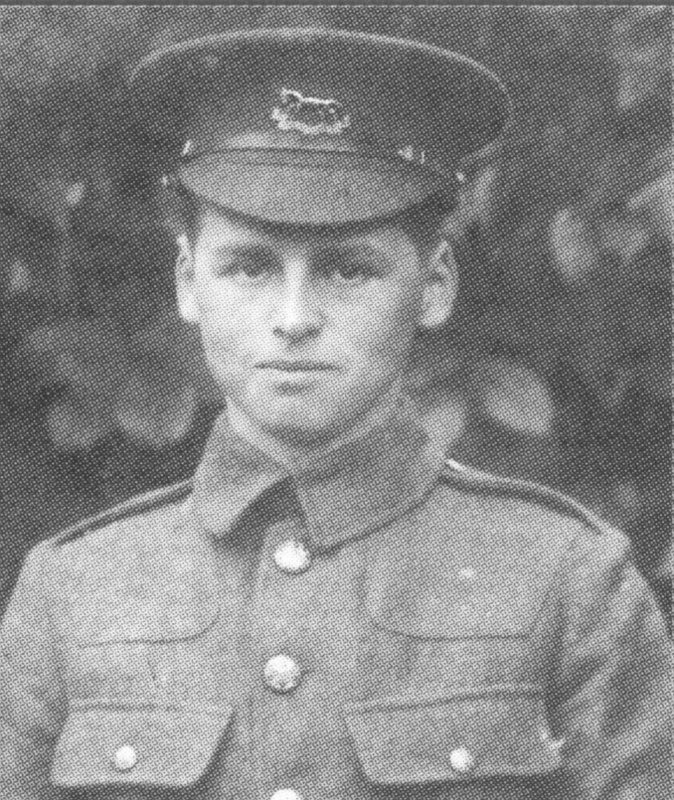 He enlisted in the Territorial Force and in August 1914 he was promptly mobilised. At that time the Territorials term of service was for home defence only, but like the majority of his unmarried comrades he volunteered for overseas service. By the following summer the 2nd Mounted were in the Middle East, and in a letter to Mrs Nottage, his Aunt, dated August 7th 1915 and posted in Egypt, he expressed great disappointment because an expected move to the Dardanelles had just been cancelled. At that time he was on guard at a military sanatorium just outside Cairo. The guards' rather boring job was preventing 600 convalescing Australian soldiers from breaking out of camp for a visit to Cairo. Douglas's disappointment was to be very short and the embarkation to the war zone came all too soon. Initially the Dardanelles venture was to be an attack through the narrow straits, with the intention of subduing the Turkish city of Istanbul, otherwise known as Constantinople. Mine fields and shore batteries made this a complete and costly failure. Then, on April 25th 1915, army Divisions were landed at various beaches on the tip of the peninsula and Australian and New Zealand troops were landed on the west coast at what became known as Anzac Cove. The rough terrain made it extremely difficult for the inadequately armed forces to advance against a tough and determined defender. Even though it had never been the intention to become deeply involved with land forces (begrudged from the Western Front) and despite very heavy casualties, more and still more troops were committed in a futile attempt to take the Gallipoli peninsula. Eventually a new attack with fresh troops was planned to be launched in August 1915 at Suvla Bay, adjoining Anzac Cove. At the outset two Divisions were involved and a third, the 2nd Mounted, was held in reserve in Egypt. The date was August 6/7th. Any limited initial success was quickly negated when the Turks' rushed up reinforcements and regained most of their lost ground. Casualties were very high and the British troops were inadequately supplied with fresh water and heavy ammunition. The disappointment Douglas expressed in his letter of August 7th to his Aunt, referred to his being in the Egypt reserve. On August 18th Douglas got his wish as the 2nd Mounted sailed from Alexandria for Gallipoli. 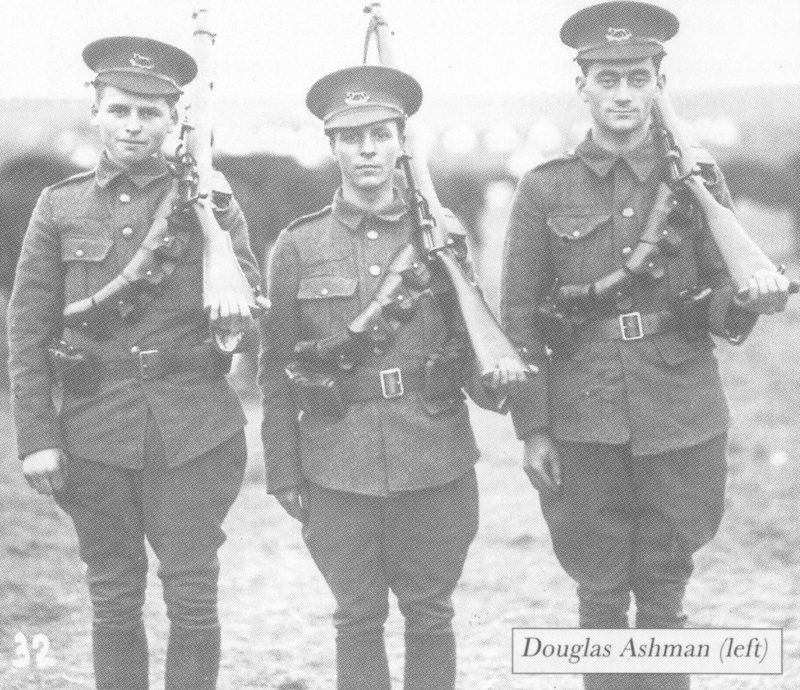 These young and raw Territorial troops were part of the 87th Brigade of the much more experienced 29th Division. They were dismounted and served as infantry as they advanced through intense heat to take up assault positions at the base of Chocolate Hill, probably so named on account of its parched and brown appearance. On August 21st at 1800 hours they were attached to the 2nd South Midland Brigade, and attacked the slopes of Scimitar Hill from their Chocolate Hill position. Intense Turkish machine gun and rifle fire mowed the young territorials down and the dry hillside scrub became a blazing inferno, incinerating the wounded and dead alike. Douglas perished there, with an enthusiasm for action so typical of the nation's youth, in the first real combat he experienced. The next day the remnants bowed to the inevitable and withdrew. By the end of 1915 the Dardanelles venture was an admitted failure and all the troops were successfully evacuated by January 9th 1916. The allied dead were estimated at 46,000. 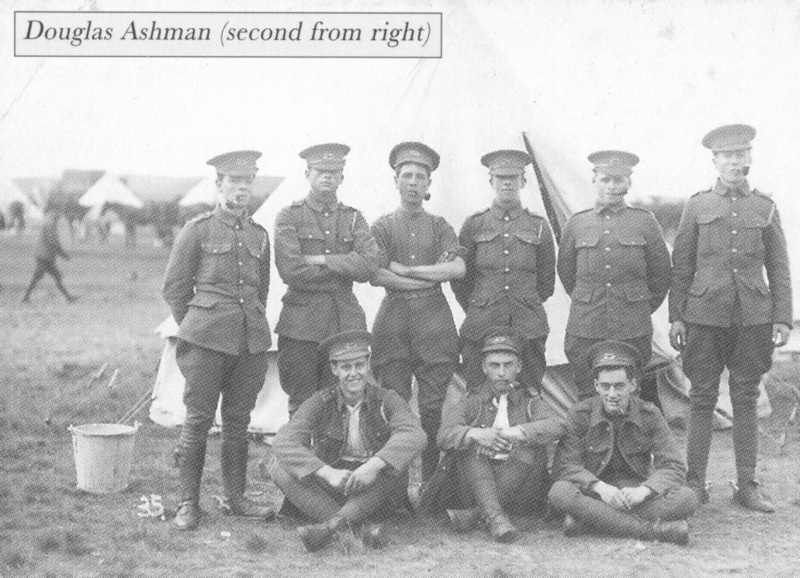 Douglas Ashman's remains were never identified and therefore he has no known grave, but is officially commemorated on the Helles Memorial to the missing, at Gallipoli. His name is on panel 18/19. There are 20,765 names on the Helles Memorial, and two other memorials on the peninsula commemorate a further 4,932 and 852 men respectively. There are a further 20,560 men with known graves. 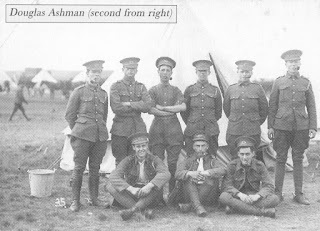 D. Ashman is the first name commemorated on the Eton Wick and Boveney Memorial and is also on the bronze commemorative plaques attached to the gates of the Parish Church in Eton. He is commemorated on the Territorials' Memorial in Windsor, which overlooks the Thames from the bowling green. He was a single man aged 23. Have just found this site. I am certain that my Great Uncle, Victor Hobbs, was in the same unit as Douglas Ashman and survived the battle of Scimitar Hill. Victor Hobbs was listed as missing on 21st August 1915 but survived with a bullet lodged in a notebook in his pocket. I have various photos, most likely from the same camp in the photograph and can share any I have. Please contact batt-rawden@rosepergola.plus.com if anyone reads this post.